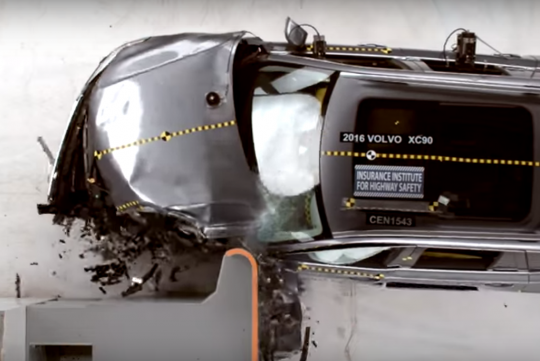 Based on Volvo's safety record, it is no surprise its latest offering, the XC90 SUV excelled in the Insurance Institute for Highway Safety's (the IIHS) crash tests. The Institute reports the XC90 got 'stellar ratings for crash protection and for its standard front crash prevention system.' It also got itself the maximum six points for having had its crash culling tech rated as 'superior.' No intrusion larger than two inches was recorded anywhere in the driver's space. The Institute added that it was most impressed with it in the most difficult test of all, the small overlap crash, where you can see in the video below. The XC90 simply pushes itself off the barrier instead of letting the car absorb the impact. In doing so, the IIHS has awarded the car its highest Top Safety Pick+ distinction.